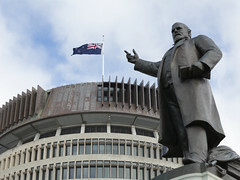 Middle-class New Zealanders could soon enjoy a tax break, as the Finance Minister hints at a tax threshold adjustment. The Finance Minister Steven Joyce has indicted that if the National party is re-elected, then it will raise the tax threshold on personal incomes. The Minister explained that the current average salary in New Zealand is NZD 55,000 per year, while the threshold for the 30 percent marginal tax rate is NZD 48 000. The disparity between the pay levels means that some people who are earning the average wage will be paying the top tax rate. Further, if the same earner is paying off their student loan, then their effective marginal tax rate will be 42 percent. New data has shown the wide gap between the country’s wealthiest and poorest people. In a new report published on January 16th, Oxfam New Zealand has revealed the state of income inequality in New Zealand, claiming that a small number of individuals in the country control more wealth than a significant portion of people. In its report, Oxfam claimed that just 2 individuals have more wealth between each other than all the wealth held by approximately 30 percent of New Zealand adults. Further, the richest 1 percent of all New Zealanders collectively hold 20 percent of the country’s wealth, while the bottom 90 percent of people holds less than half the country’s wealth.